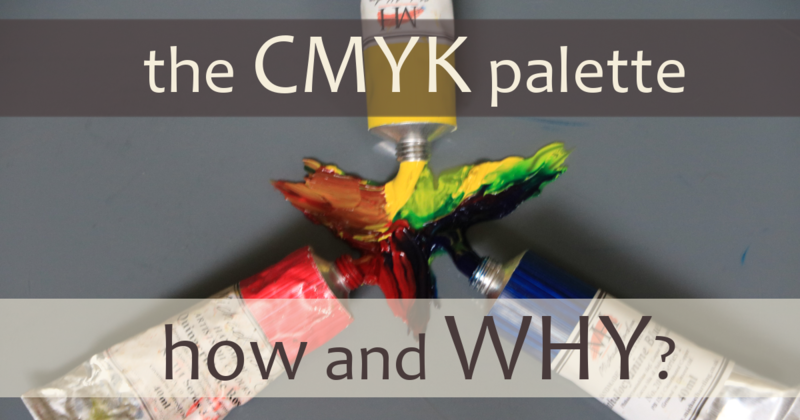 The CMYK palette – how and why? One of the more popular of the “primary” palettes for painting you might have heard of is the CMYK palette. Cyan, magenta, yellow and black. The “primaries” here are cyan, magenta and yellow. The black is added, presumably, to extend the value range. I’ll be honest: Before I started looking seriously at this palette I was extremely sceptical of it. Why? Well, because it comes from photographic printing, and printing is inherently different to painting. Well, funnily enough, at the level of light and colour, it’s not that different – especially when we’re taking about glazing. The light that creates the colour sensations in the brain is reflected in a very similar way in both processes. The wonderful David Briggs explains why, they both use a combination of additive average mixing and subtractive mixing. This page explains in detail what’s going on when we mix paint. The more I learned about this palette – about these specific colours – the more I realised that there’s much more to this than just some odd and niche primary palette idea. That doesn’t mean to say I think it’s a good idea to paint with it, not at all. I’ll get on to that later. But it’s not as simple as it first seems. Mostly because the science it’s based on – or extrapolated from – is basically sound. Whilst investigating this palette I learned some very interesting things, which I’ll share with you at least in abbreviated form here. Because you can’t really evaluate the usefulness or otherwise of this palette for painting unless you do understand where it comes from, and that means the science of light and the process of printing. No, I’m not going to go into real depth on that in this post. Because again, David Briggs has already done a wonderful job of that, particularly here. If you’re interested in really learning where all these various primary theories came from, I strongly recommend reading his site in depth. Probably more than once. I’ve continually referred to it as I’ve been researching CMY, and there is still much for me to learn there. There is no better website on how colour works, as far as I know. Basically, CMY are the subtractive primaries. So you start with white (which reflects the widest spectrum of light) and then by subtracting areas of the spectrum using transparent “masks” of one of these primaries, you can create a wide gamut of colour. The thing is, there are two different ways this palette is used in painting, that I’ve found. And they are so different as to necessitate dealing with each separately. The first is using the colours as transparent glazes over a bright white ground. It’s very close to printing, in fact is a kind of translation of the process from a machine to a manual implementation, and essentially works the same way. The second is painting opaquely – as we would normally understand it, mixing those primaries with white (and black, if you like). This is much easier to get a handle on, so let’s start with the tricky one first. This painting is by Maxfield Parrish. I mean wow, look at that. Even in reproduction it’s pretty amazing. The colour is unlike any colour I’ve ever seen in oil painting. Not because the chromas or hues are unachievable any other way, but because it’s so idiosycratic! Although it’s painted, it looks like it’s printed. And most of his work was done for reproduction. You can find a lot more of his work on Google images, and it is amazing. But the real world simply doesn’t look like this. That said, this idealised, fantasy world is undeniably beautiful and compelling, it seems to me. In fact, Maxfield Parrish was directly influenced by the printing process he saw and attempted to replicate it in paint. And he came pretty close! Here is one of his paintings part way through – you can see the resemblance between this and the printing masks above. Now, it strikes me that if you’re going to paint like this, you’re going to have to be extremely meticulous and organised, planning every stage several steps ahead. You need to paint with almost machine-like precision. It ought to be possible, in theory, to paint realistically using this method, but I think it would be so difficult as to be very nearly impossible. 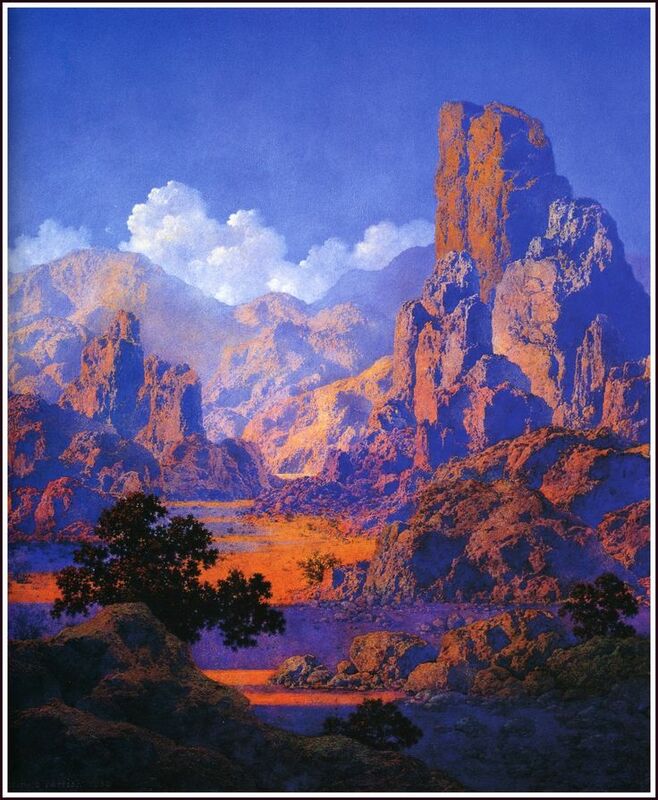 And Maxfield Parrish’s work, whilst representational – and beautiful in my opinion – isn’t at all realistic. Looking at both those methods closely, it appears very much to me that there may some projection or even direct printing of the photo reference they start from onto the canvas. The level of detail and control is so high. You could possibly do it all manually, but the finished effect is so close to printing, for the drawing out, that I’d be surprised if there wasn’t some of that, or at least projection and tracing involved. That doesn’t make it bad. It doesn’t mean it isn’t art. At least, not to me. But I would consider it to be a different art form than the one I’m involved in, and probably yours too, if you’re reading here. So although the process is fascinating, I can’t see me ever using it in such a meticulous way, and across the whole of the image. These approaches are essentially idiosyncratic and demand such a high level of precision, as well as being so very different from what most of us understand to be painting (especially traditionally) that, amazing as they are, I think that they are not particularly relevant to the majority of painters as a model of colour handling to learn from. Ok, I’ve got to come clean here. I haven’t finished my tests with this yet. I’m doing some test mixes to find out what range of colours you can mix with this palette, and also to see what it’s like to try to mix low chroma colours with. For these tests, I’m using white as well as black, because if you’re painting opaquely, you have to use at least some white. I’m also doing some basic glazing tests to see what chroma can be reached, and that’s taking a little while because paint has to dry between layers. I’m planning to share the results of all these tests in next week’s post. Isn’t there something in between? Well, possibly, yes. I’ve seen at least one video on youtube where an artist was mixing tube paints together in the usual way, ostensibly CMY, but without using white. What she was doing was adding very large amounts of medium in order to make the paint more transparent. In some cases, there was more medium than paint – much more. Personally, I find that more than a little worrying. 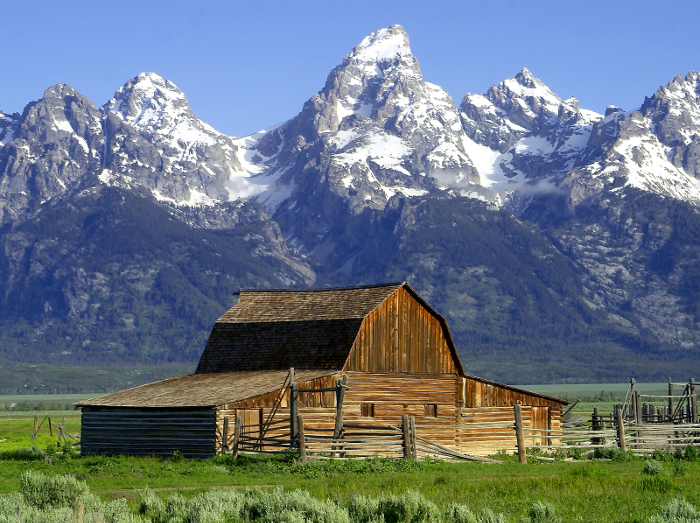 Everything we know about longevity of paint films goes against this. It’s a good rule of thumb to use as little additives as you possibly can, especially resins. And modern alkyd based resins haven’t been around all that long. Also to bear in mind is that Maxfield Parrish’s paintings have some serious problems, apparently, not least being a marked yellowing because he varnished between glazes. One of the problems with this palette is that there doesn’t seem to be a general consensus on exactly which pigments we should be using for our cyan, our yellow or magenta. The most common pigments I’ve seen recommended are, for the cyan PB 15.3 – Phthalocyanine blue. For the magenta, usually a quinacridone. I’m using PV 19, quinacridone rose, in my tests. For the yellow, PY 74 seems a popular choice, and is the one I’ve been using. But I’m also going to try PY 3, since the yellow should probably be more towards a lemon yellow. A quick word here, because this bothers me. There are paint manufacturers putting out what they call process colours, or primary cyan, magenta and blue. What bothers me about this is that it tends to suggest that there’s something special about these particular tube paints, something different: There isn’t. In the cases I’ve seen from Talens and Daler-Rowney, they are the pigments I’ve just mentioned. The cyan in particular, in the Talens range, includes PW 7 – Zinc white. So if it’s complete transparency you’re after, I would have though that would tend to make it more opaque, no? Is there a place for CMYK in oils? Maybe. David Briggs recently said to me in a very interesting conversation on Facebook that he thinks it’s a good starting point for a selection of tube paints to recommend to a student, say, from which you could then add paints to allow higher chroma in some hue areas (red orange etc) and some earths and black to help with low chroma colours. I’d agree with that, except that personally I don’t see the need to start with primaries if you’re choosing a fuller palette. To me, I would just make sure that you hit a good chroma in a wide range of values all around the hue wheel, and then , as David suggests, add black, white and earths to make low chroma colours easier to mix. But I’ll think a bit more about that. It may be because I use a different mixing method than most, one I find to be much more effective and which allows finer control. I’l probably be covering that (again) in more detail soon. So how useful is it? Well, I want to see the results of my tests. But frankly, it seems to me that unless you want to do something esoteric like Maxfield Parrish, I would say that using this palette is likely to confuse you more than help you. If you’re mixing with white and not glazing, then you can mix a wider gamut – and so paint with more chroma – with a wider set of tube paints. So vibrancy alone, if you mix with white, is no argument for this palette. If you really want to use very few paints with the widest possible gamut of colours, then CMY is certainly better than red, blue and yellow. I can’t see how using such a restricted palette will help you learn to mix better, or paint better, come to that. If you want to reach a wide gamut, closer to the widest gamut that can be achieved with paint, then you will need to add more colours. So really, the only real reason I can see for using this palette is that you want to use very few paints and get the widest gamut you can with them. For reasons of expense, perhaps, or weight, you think it’s a good idea to only have three or four tubes in your box. Apart from the rather idiosyncratic approach that painters like the photorealist Don Eddy and Maxfield Parrish used, which after all do come quite close to a mechanistic, printing process, there is really no good reason to use this palette that I can see, based on the properties of the paint alone. But let’s wait for the test next week before making too many hard and fast statements. Of course, these are just my thoughts after messing about with it for a few hours. You could say that was unfair, and you may very well be right. After all, I didn’t decide that Munsell was a useful system until I’d spent many, many hours with it (I was very sceptical at first). Regardless, I would really like to hear from anyone who habitually uses this palette. I’m genuinely interested in knowing what it is you feel you gain from it, that you couldn’t get any other way. If you can demonstrate your points with examples of your work, or work by other artists you admire that you feel demonstrates what you’re saying, that would be really helpful. Either post in the comments here or drop me an email at paul – at – learning-to-see.co.uk. Finally, I want to say thanks very much to my facebook friends who pointed me towards a lot of the resources in this post in a very interesting conversation we had about this palette and its uses. This conversation is ongoing and I expect to learn more from it as it unfolds. If you want to be a part of it (or just watch) hook up wth me on facebook. Process printing with CMYK is creating an illusion of color with ultra tiny little dots of each primary…. overlaid… much like what TV does with RGB (red, green, blue). This can’t be duplicated with the painter’s hand. Solid color use of CMYK, on the otherhand, is about as limitless as traditional oils. CMYK primaries can be mixed on a palette to achieve almost any color imaginable. As a retired printing company owner, I have often wondered why CMYK wasn’t more popular among painters. I don’t think I ever encountered a situation in my 40 years, that the Pantone CMYK system could not match a needed color. Well…… I think the Maxfield Parrish painting garish. Otherworldly for sure. It’s beautiful, though, in it’s own way. I like the color of the Ten from Boston, Paxton one of my favorites. Paxton did not use the Mattelson palette, regardless of what he claims. The palette according to someone who had studied at Atelier Lack and with Ives Gamell was a cool and warm yellow, cool and warm red, cool and warm green (I have to look up the exact colors but Cadmium lemon, yellow ochre, Naples yellow, vermillion or Cadmium Scarlet, Indian red or a light read both cobalt and cerulean blue… Not sure if I am remembering correctly. I like the variety they get using warm and cool of each color. It’s a full palette but not a palette with every hue, value and chroma imaginable like the one I trained on. You can always add more colors as needed for the particular painting. I think the palette is sound. Aloha! Your experiment with the CMYK color is informative. A few years ago I tried to paint in the Maxfield Parrish manner. I always wondered how he created the effect of a Utopian vision. My grandmother had one of his prints over her tv when I was young. Spent more time studying it than watching the tv. I researched his methods and works enough to try it myself. It was a method that was not spontaneous enough for me. It was too formulaic and since I do not have the illustration background that he had, I did not achieve the depth with the colors. I enjoyed your interesting and informative account of experiences with CYMK painting. I have also recently experimented with this system and have found it very useful. I used the Winsor & Newton Galleria range of Process Cyan, Process Yellow and Process Magenta (plus Mars black and Titanium white). All three of the “Process” pigments are given as Permanence = A; Lightfastness = I (ASTM) – which is excellent. (A few years ago the CYMK pigments tended to fade but this has apparently changed). I found that I could achieve a wide range of colours after a little practise and even subtle shades were achievable. 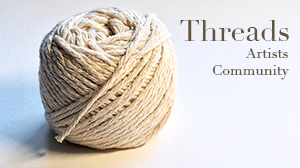 An account of my experiments and two examples of my efforts are in the blog on my website shown below. I suspect that It may be hard to persuade professional artists to change to this system and I have not yet found pigments in the professional oil or acrylic ranges with a “Process” name. Paul: I notice that my earlier reply did not include my website in the body of the text so my reference to it “below” makes no sense. I also note that I incorrectly used the term “CYMK” rather than “CMYK”. Could you publish the corrected version below, please? https://vimeo.com/272093711, Paul, may I try to respond with my thoughts on the questions you raise, from my recent experience using Acrylic CMYK “Process” paints. Firstly I do indeed use glazing on a white ground (Gesso prepared canvases) with thin washes of Acrylic CMYK paint diluted with either water or Galeria Fluid Retarder Medium – or occasionally Winsor & Newton Artists’ Acrylic Medium. An example of this is in the bright blue sky of the painting of Perth – the third painting shown in my recent blog: https://peternewell.blog/cymk-painting-2/ . However, most of the time I mix the paints (rather than use them as glazes) and use them sufficiently thickly to make them appear opaque rather than using their inherent transparency. This opaqueness is particularly apparent, of course, if they are mixed with white or black. You also ask about adding white to increase the value: yes I do indeed regularly add white (Titanium white) to the CMYK paints – as seen in all three paintings shown. Generally I find that mixing these CMYK paints to get the desired colour is not at all difficult – after a bit of practise – and in many ways simpler than having to think of the (often complex and sometimes a bit unpredictable) effects of mixing paints which are themselves mixtures of several different pigments. Just re-read through this post from Paul, it’s been in the back of my mind for a bit as something to revisit, absorb the information more and see if there was any further outcome to the planned experimentation. I’ve visited your site Peter and you make some interesting observations there. I’ve only ever played with watercolours before and had acrylics in mind to try out at some point in the future. After seeing your webpage and some of the others I reckon I’d be interested in trying out with a CMYK palette from the outset – I think that for someone like me who isn’t going to be obsessing over total colour accuracy for a while yet it would be worthwhile having a muck about. And for just around a tenner having a wide range of bright colours is appealing rather than spending five times that just to find that acrylics aren’t for me. Coincidentally, after fighting with my Epson inkjet for the hundreth time at the weekend and deciding to trash it I now have some CMYK inks spare – they seem to water soluble so I’m going to be doing some zero cost experimentation. Again, just to reiterate I’m not going for realism or colour accuracy. I’ve been comparing a giclee reproduction of one of my drawings (not a painting admittedly) and regardless of how closely I look I can’t see any difference in the colour which in itself was impressive, however I also can’t see the usual spottable spots associated with home inkjet printing with the naked eye. I think I prefer the giclee in fact. Thanks Steve! I enjoyed your Website – you’ve done some great drawings and water colour portraits! I have never been happy using water colour (there is no second go when you get it wrong!) so I am doubly impressed. I would be interested to learn of the outcome of your experiment with the inks from your inkjet printer. They will, of course, be very transparent compared to paints, so this could have interesting results! and Mars Black and Titanium White. They worked fine and I used them for finishing off a CMYK acrylic painting to give a bit of extra colour intensity in particular places. So for anyone wanting to try CMYK but preferring oils I recommend them. In the UK they cost £10 per 200ml tube and are touch dry in a couple of days. I have the suspicion that why CMYK palettes often fall-short in oil painting is the application mode is so different than process-printing. Process-printing uses pure color applied separately in discrete spots of ink, they maintain their individual color integrity. While in painting the component paints are blended — with all the complex pigment-chemistry and hue-value-chroma “costs” involved. 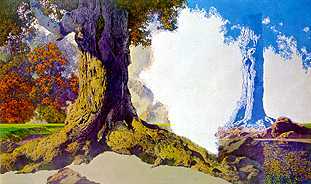 Maxfield Parrish attempted to approximate this separation through his exhaustive glazes, but there were still “costs” since he couldn’t achieve the moire-effect to allow bits of each layer of glaze to be unobstructed like in process-printing. Ironically, digital-painting partially achieves this since the final video-display relies on illuminated pixels, or 4-color or 6-color digital-printing outputs. Conversely, digital reproduction can’t create the vivid, pure whole-tones of painting, or that of dedicated single-color spot-printing. A spot of red paint is “Red”, not a fuzzy cluster of primary constiuents in-emulation of “Red”, at both the micro- and macro-scales.